The more i look at it, the more neat design features that i just love but most people who dont know about watercooling will miss (recessed drain and fill ports for one). There are a few things I would do differently eg - All computers have to have two hard drives for RAID 1 and i dont like how he used 'push on' tubing ( and with the new rotating compression fittings you dont need to worry about hose kinks). 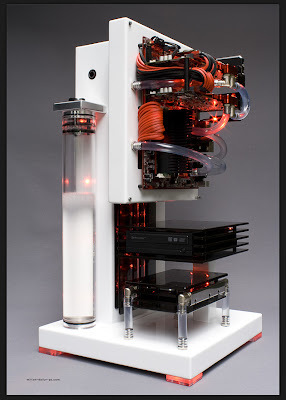 I also hate water cooling systems with 'active radiator' eg. with fans - go all passive or dont bother watercooling at all you are just 'moving heat' (you can see his radiator with fans in photo 7). Puts my watercooled rack to shame. P.S. - if you want to see passive cooling check out this photo the 4 black things on the side are passive radiators - I use the same things, they are called cape cora's and I have 32 of them on the side of my rack.